After the closing date winners for the giveaways will be drawn at random from both the email and coupon entries. Winners will be notified within one month of the closing date. Welcome to our blog! 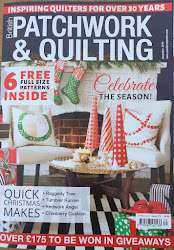 British Patchwork and Quilting Magazine is a monthly publication written by quilters, for quilters, with projects and features.